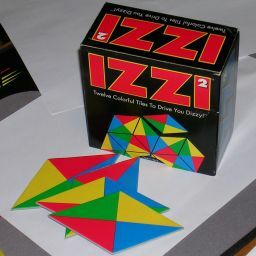 Izzi 2 is a tiling puzzle made in 1993 by Binary Arts (now called ThinkFun). Like the original Izzi, it was designed by Frank Nichols. Each tile is diamond shaped, and the four edges have different colours. Every tile uses the same four colours (red, yellow, blue, green) in a different order, and every possible order is represented leading to 12 tiles (4! orderings, divided by 2 because of the 180 degree symmetry of the tile shape). The booklet coming with the puzzle shows 39 different shapes. The aim of the puzzle is to put the tiles into such a shape while making sure that all the touching tile edges match in colour. 27, 15, 10, 8, 21, 29, 13, 1, 2, 30, 23, 38, 7, 25, 11, 9, 4, 35, 34, 31, 28, 17, 20, 26, 12, 18, 33, 3, 39, 37, 32 & 22, 5, 14, 16, 36, and 24 & 19 & 6. ThinkFun homepage, the current name of the manufacturer Binary Arts. The tiles form a complete set (i.e. every possible colour combination occurs exactly once) so if you have a solution, any permutation of the colours can be applied to create another solution. Even if you ignore such colour permutations, and any symmetry of the problem shape, all the problems have several solutions. In the table below, the colour permutation is taken into account in the number of solutions shown, but the symmetry of the shape is not. 8 Only 4 essentially different solutions, all shown here. 24 Only 8 essentially different solutions, the 6 shown here, plus the last two "rotated" by 90 degrees. 8 Only 2 essentially different solutions, both shown here. 16 Only 8 essentially different solutions, the 4 shown here, and these in "mirror image". 66 Only 11 essentially different solutions, all shown here.